The Ruby Room Comedy Show! Next up, we’ve got two comics doing SET LIST, improvised stand up comedy from random subjects which are COMPLETELY UNPREPARED. 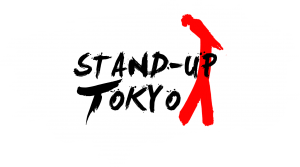 Finally you join four of Tokyo’s funniest for the STAND UP TOKYO SIT DOWN, Tokyo’s only four-way comedy talk show and podcast about Japan. Recorded live and broadcast later on iTunes. For 2000¥ you get all this plus TWO free drinks from the bar. So Join us next Thursday, 7.30 pm (8pm start) for 2 hours of Shibuya’s best stand up comedy in English. No Replies to "The Ruby Room Comedy Show!"